4 labyrinths found. Showing 1-4. Sorted by country, state, city, then zip/postal code. Open walks in Edinburgh on last Tuesday of the month and in Glasgow first Sunday of the month. Available for conferences, retreats, schools etc. Ask for details. Labyrinth Advanced Facilitator & Veriditas Master Teacher Di Williams, owns and travels with portable labyrinths to lead labyrinth sessions, quiet days, training days/weekends, retreat weekends & weeks. She also leads sessions on the permanent, pavement Edinburgh Labyrinth in George Square Gardens in the centre of the city (or your own outdoor labyrinth). urgh+EH8+9AL+Scotland - for further location details. 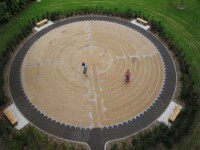 The Edinburgh Labyrinth is usually open weekdays 7am-7pm (4pm in winter). For details about workshops please call +44 (0)131 650 2595 or visit the website above.